Check out these 101 baking soda uses: you'll be surprised how many problems you can fix with one small box of baking soda! There are many common uses for this product, so it only makes sense to have a box or two sitting in your cabinet for when you need it. People have been using baking soda for generations to take care of many different problems and of course, for cooking. Here are 101 baking soda uses, some of which may surprise you. Baking soda, as the name suggests, is used as a base in many recipes. It is a dry leavening agent so when mixed with an acidic element like vinegar, buttermilk or lemon juice for example, carbon dioxide bubbles form and the batter or dough begins leavening. 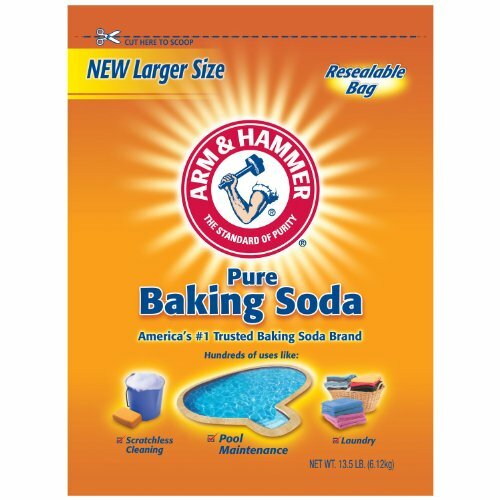 ARM & HAMMER Baking Soda, 13.5 Pound Add two or three tablespoons of baking soda to a large bowl or sink of water. Allow your fruits and vegetables to soak for about 15 minutes to remove dirt, pesticides and other residues. If needed, you can gently scrub your fruits or vegetables with a brush, then rinse thoroughly. For an even better effect, add a drop of lemon essential oil. When using recipes that call for sugar syrup, you have to be very careful to keep the syrup from crystallizing. However, adding just a pinch of baking soda to the boiled syrup will take care of the problem so do you don’t have to worry about it. Beans tend to make most people a little gassy but there may be a simple solution to this age old problem. Add about a teaspoon of baking soda to the water before putting your beans in to soak and it should neutralize the gas. Pour 2/3 cups baking soda to a bowl then slowly stir in water to make a paste. Stop adding water when it reaches the desired thickness. Transfer the mixture to an airtight container and you’re done. You can also add a hydrogen peroxide solution and a drop or two of peppermint oil to your toothpaste for a fresh feeling. Here’s more details about making your own toothpaste. If you’re looking for a great way to freshen your breath, add a teaspoon of baking soda and 2 drops of essential oil (peppermint and wintergreen are my favorite) to about four ounces of water and rinse out your mouth. The baking soda will neutralize the odor and the oils will leave your breath smelling fresh and clean. Remove food particles and make oral appliances smell fresh by adding enough warm water to a bowl to cover the dentures, retainers, etc. Then add 2 teaspoons of baking soda to the water and stir until it is completely dissolved. Next, place your oral appliance in the water to soak. Place a teaspoon of baking soda in a cup and then add water and stir until you have a paste. Use your finger to rub the paste on your teeth and leave it there for about five minutes. Be sure to rinse well to remove all the pastes.